Hey, just so you know ... this post is now about 3 years and 1 month old. Please keep that in mind as it very well may contain broken links and/or outdated information. 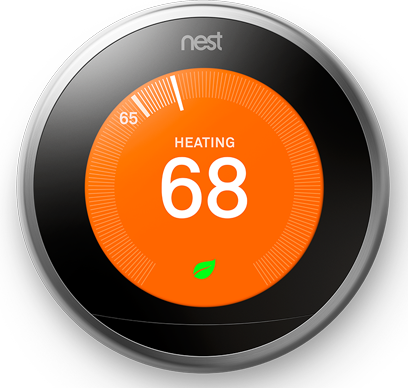 I’ve been wanting to try the Nest learning thermostat since the first one was released back in 2012. At the time, though, I had just installed my ADT Pulse and Z-Wave home automation system. Putting in the Nest would mean using a separate app to control my home’s temperature outside of Pulse with no integration between the two systems. Fast forward to 2015: in July, ADT announced that Pulse now supported the Nest and in September, the 3rd generation of the learning thermostat was released. 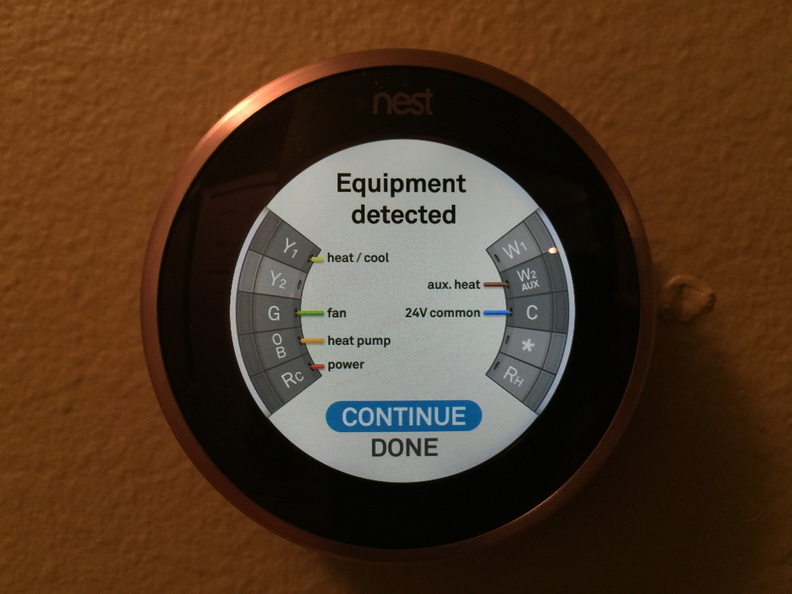 The Honeywell Z-Wave thermostat that I had added to my Pulse system in 2013 was functional, but not “cool” so I finally decided to give the Nest a try. 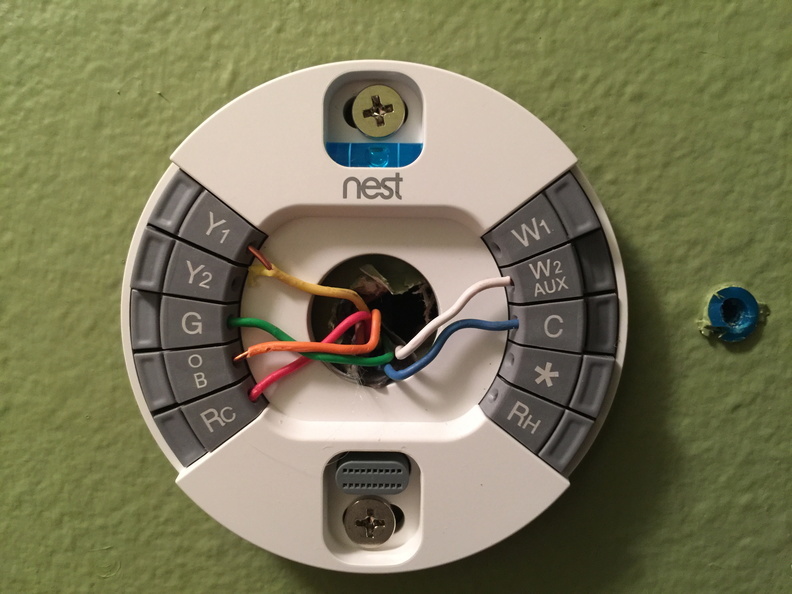 Since I had prior experience installing my Z-Wave thermostat, installing the Nest was pretty straightforward: remove the old thermostat’s faceplate, disconnect and label the existing wires, and remove the base plate; install the Nest’s base plate, re-connect the wires, connect the Nest. I did have to create some new holes in the wall since the Nest base plate didn’t line up with the holes from my old mounting plate, but that was no big deal (other than having to do a little patching and painting after I was done). After snapping the Nest onto its base plate and turning the breaker back on, I was guided through the setup routine: connecting the Nest to my home WiFi nework, setting my location, configuring my HVAC system type, and doing a final test. The user interface is pretty simple and elegant: rotate the stainless steel outer ring to move the menu selection highlight, and press/click the display to select (it’s not a touchscreen, just one big physical button). Linking it to my existing Nest account was easy too: the thermostat displayed a code on the screen which I typed into the web site and then it appeared alongside my cameras on the site and in the mobile app. FarSight is a new feature enabled by the high-resolution display on the 3rd generation Nest. It allows the thermostat to “wake up” when it senses movement (up to 20ft away) and display a clock, the temperature, etc. Unfortunately I’ve turned off all the motion-sensing features since my thermostat is located in a hallway where people are walking past all the time and it’s more annoying than useful. 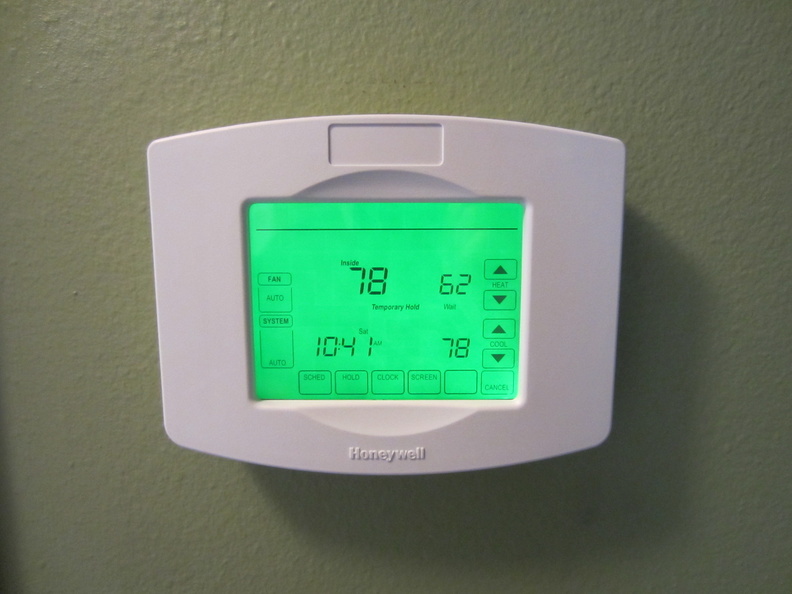 My Honeywell thermostats were programmable, meaning I would program in the heating and cooling setpoints (by day and time) into the thermostat (or the ADT Pulse site, tied to automations). 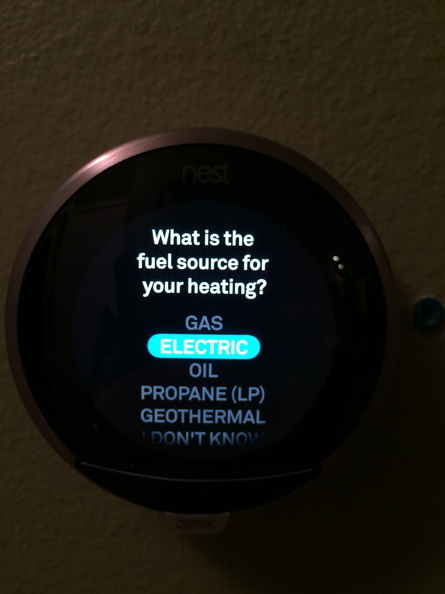 By contrast, the Nest is a learning thermostat. For the first week we’re supposed to just change the temperature to where we want it at different times of the day. The Nest will start to learn patterns and then build its own internal schedule. The built-in sensors should also determine when no one is at home and adjust the temperature accordingly (and can also be used to trigger Dropcam recordings with Nest Sense Auto-Away). 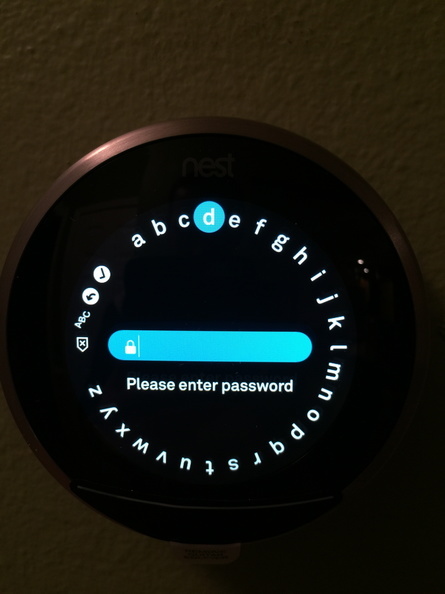 The Nest works with ADT Pulse through the Works With Nest API. This allows my thermostat to appear in the Pulse app so I can control the lights and temperature in a single app. It doesn’t appear in the Pulse web site, though, and I can’t use it in schedules and automations. This makes a sort of sense (since the Nest is meant to learn and create its own schedules and not be controlled or overridden by another app) but was confusing to me at first. It did allow me to pare down my various settings in the Pulse site, though, so it worked out that way. It’s only day 2 for me, so I’ll have to revisit this post in a few months to report back on how well the Nest has become a part of my home automation and control network. I started having a strange issue with my thermostat the other day: it suddenly dropped off the wireless network and I could not get it to reconnect (all other wireless devices in the house were fine). Additionally, the thermostat UI was freezing and locking up while I was using the ring to scroll through options. I tried resetting the network settings, rebooting the device multiple times … nothing worked. The thermostat was still functioning properly otherwise (cooling the house, running the schedules, etc.) but since it wasn’t connected to the internet it couldn’t automatically go into Away mode or be changed via the mobile app. So I called Nest Support. After almost 30 minutes on hold (waiting for online chat support was no faster!) I finally got to speak to Mike. He listened to my description of the problem and for the next half hour walked me through various troubleshooting tasks (trying to connect the thermostat to my PC, hard reboot while off the mounting plate, etc.) but still the device wouldn’t connect to my WiFi and would still lock up. Since the thermostat was still covered by Nest’s 2 year warranty, Mike said he would ship me a replacement. The new thermostat arrived a few days later. I just had to pop the old one off the wallplate, click the new one on, and return the defective one with the prepaid shipping label. 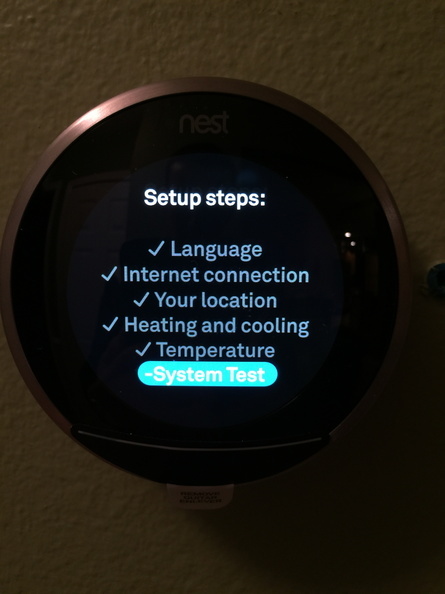 Unfortunately, a lot of the on-thermostat settings aren’t saved in Nest’s cloud service. So once I had connected the new thermostat to my wireless and then logged into my Nest account, I had to re-do my configuration like the display settings, air filter reminders, etc. etc. Nothing major. I was also able to copy my schedule from the old thermostat to the new via the Nest web site, so that was nice (although Mike said the new thermostat would still go through the “learning” process). Overall, I am very satisfied with how Nest handled the problem and the replacement.